As a wedding photographer here in Charleston Sc, I always try to give my clients some great advice. You see for me, I mostly photograph large weddings, and I see many friends and family traveling from very far distances. 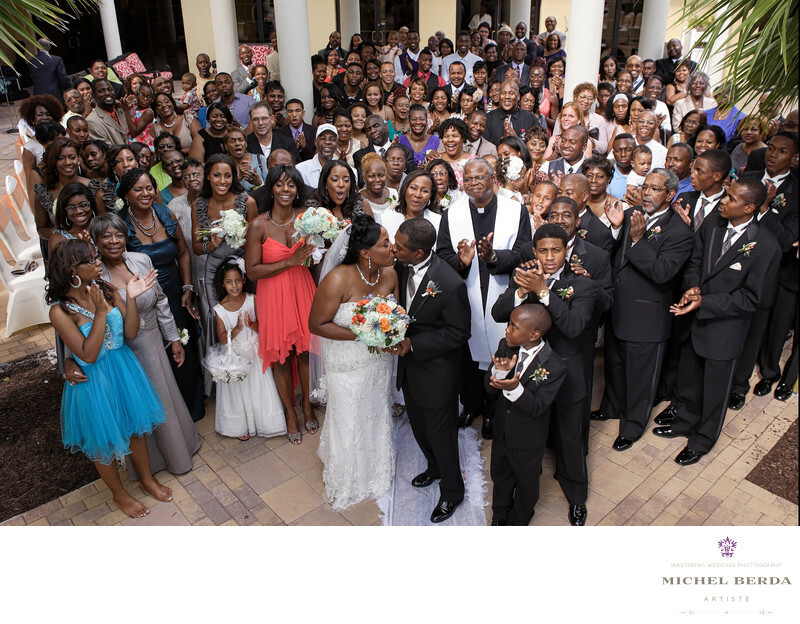 In order for the bride and groom to remember their Magical Day that goes by so very fast, I always think it is a very good idea to remind them as I did for this wedding at The Charleston Marriott on Lockwood Blvd, in Charleston, Sc, to have everyone photographed in one photo. The best way and the only way to do this is when the ceremony is over, if it is organized properly and put into the timeline has it is done by me all the time, you can get an amazing image and result that incorporates everyone in the photo. At this venue because we had organized this photo opportunity, I asked the wedding at The Charleston Marriott coordinator for that day Younesse, to have a ladder ready for me. As the bride and groom kissed the minister reminded everyone that the bride and groom wanted to have one photo that included everyone. You may think that this will take a long time, that the family and friends will not be able to enjoy the cocktail hour. Clearly not the case with me, this usually takes me no more then 5 to 8 minutes, and I understand that I need to get this done in an expedited matter. I just want to put a little extra effort of my wedding photography for my couples to make sure that I capture as much from their day as possible, because my wedding photography is what they will cherish for many years to come. Keywords: The Charleston Marriott Hotel. (3), Wedding Group Photo (3).